While the band was playing selected festivals during the summer season the release of “Turisas2013” will be supported by extensive European touring. After joining the Heidenfest 2013 they will play a UK headlining run. The new album “Turisas2013” is out now in all Europe, with UK and North American releases following next week. Find a copy for yourself from various webshops and listen to it online on Spotify. Pre-orders for the new Turisas album now online! ‪”TURISAS2013‬” ALBUM PRE-ORDERS ARE NOW LIVE! 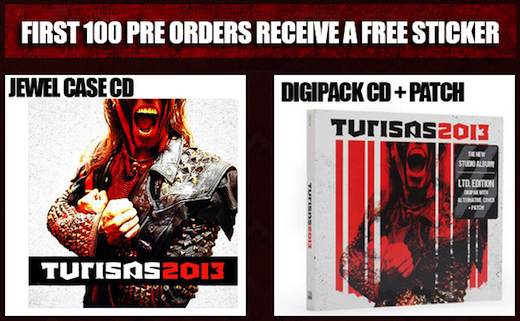 Head over to our own webshop http://turisas.mamstore.co.uk/ and get yourself one of the many cool bundles we have for you. First 100 pre-orders will also have a free sticker to go with them! In addition to the exclusive t-shirt, we also have a special GIRLIE t-shirt bundle + LTD EDITION RED VINYL album bundle available.